The Volvo 7700 Hybrid is a parallel hybrid, which means that a diesel engine and an electric motor work together or independently to power the bus. In urban traffic fuel savings are up to 35 percent and in suburban traffic approximately 20 percent. The electric motor is used to start the bus and to accelerate it up to about 20 km/h, giving you considerable fuel savings and near-silent take-offs. With full torque from the start the acceleration is excellent, offering quick starts from standstills. At higher speeds, the diesel engine takes over, while also recharging the batteries. Since the electric motor serves both as a motor and a generator you actually recharge when driving and braking. During idling at a red light or bus stop the diesel engine is shut off, resulting in zero emissions. 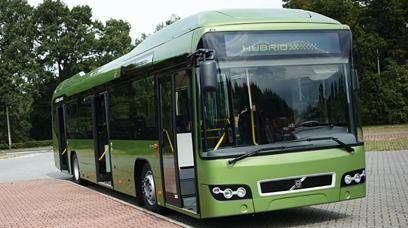 The Volvo 7700 Hybrid bus proves that low emission levels and high capacity can be combined. The Volvo system reduces emissions of CO2 dramatically, but also NOx and particulate emissions by as much as 40–50 percent. With an optional filter particulate matter can be reduced by an additional 80 percent. Buying a Volvo bus opens the door to a complete offer of services and products for increased productivity; from service contracts, fuel management systems and certified Volvo 7700 Hybrid mechanic on site, to driver training. There is also a wide variety of other services such as refurbishment of an older vehicle, parts online and 24/7 help with Volvo Action Service. Some of the services are offered with a fixed price per kilometre, depending on local market conditions and driving distance, while other services are one-time costs. Urban traffic is facing a lot of environmental challenges. Our answer to these challenges may very well be the best business decision you have ever made. The hybrid technology of the Volvo 7700 Hybrid is the leading environmental solution for buses in urban areas, and the only commercially viable hybrid on the market. Without compromising on performance, and still delivering emissions reduction by up to 50 percent and fuel savings of up to 35 percent, it is a truly competitive alternative for urban transport.